Fun Giveaway! $20 Giftcard to the Store of Your Choice! UPDATE: Giveaway has ended. Congratulations #243- Ellie W! I had fun the other day turning our sharpie tie dye t-shirt into a reusable grocery bag. The best part? No sewing! To learn how you can make your own easy grocery bag from an old t-shirt check out my tutorial over at Saving with Shellie. Also...Shellie is sponsoring a great giveaway that should be fun for everyone. One Having Fun at Home reader will receive a $20 gift card to the grocery store of their choice! To be entered to win, just leave a comment on this post and tell me the name of your favorite grocery store. 1. Like Saving with Shellie on Facebook. 2. Like Having Fun at Home on Facebook. Leave a comment for each entry along with your email information so I can get the gift card to you if you win. On Friday, July 13, I will chose a winner using Random.org. Did you know that painting with watercolors on sand dollars produces a really neat effect? I didn't until the other day when my kids and I spent a morning painting. Lately, I've tried to maximize our fun to clean-up ratio by saving messy art for times when we have two or three full hours to devote to the fun. So, the other day, I covered our kitchen table with a drop cloth and we spent the morning finding everything and anything our imaginations could think of to paint on and with. It's hard to improve upon God's creation. The sand dollar was probably actually prettier in it's original pure white form, but I think these are lovely in their own way as well. I got my sand dollars at a garage sale, but I discovered recently that you can also buy sand dollars on Amazon. Ever since I discovered the fun sticker and tape resist art technique that bloggers like Putti Prapancha have featured, I've been giddy with all the possibilities. We've done thank you cards, and tape resist collages, and just yesterday we tried our hand at sticker resist t-shirts. Michaels has been had some pretty decent t-shirt sales, and I bought up a bunch of them the other day. I got out our big pot of foam alphabet stickers and let the girls dig through to find the letters of their name. We made sure that the stickers were pressed on nice and firm and that the names were centered decently well. Then I got out the acrylic and fabric paints we happened to have around the house (acrylic paint works just fine on fabric, by the way...the only real advantage of fabric paint is the softness and flexibility) and told the girls to dab on colors close to the foam stickers. They needed to guidance (and help in little G's case) getting the paint into all the little corners and crevices, but we got there eventually. Since the girls like using lots of paint, I let it dry for about 4 hours before I ventured to take off the stickers. I think next time, I would choose slightly larger alphabet stickers, but mostly, we were pretty happy with our t-shirts. I like how they look kind of like a celebration of children's arts and crafts. The Sharpie Tie Dye method is not at all original to me. 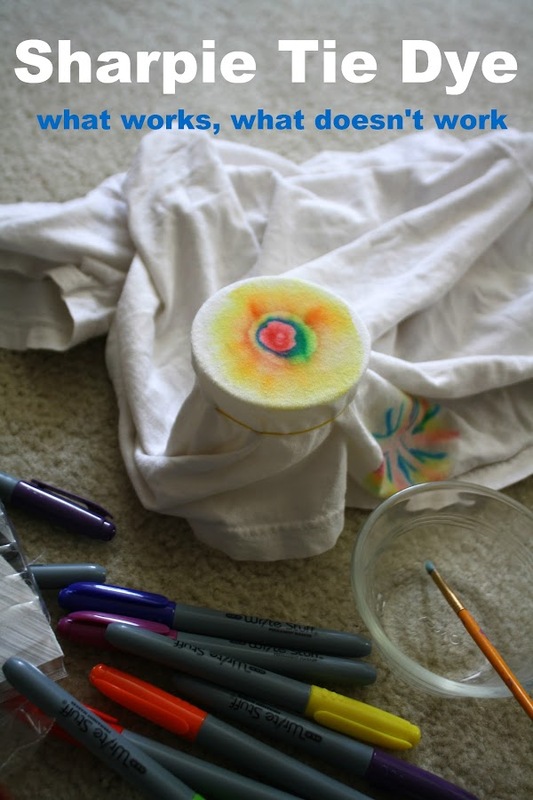 I've seen it around Pinterest a lot, and as far as I can tell the first person to do the sharpie tie dye method was Steve Spangler Science. But it was the first time for us, and we enjoyed the results so much I just have to share! 1. Use small cups and a rubber band that fits tightly. 3. Use a paintbrush to dab on the rubbing alcohol rather than a eye dropper . The color bleeding is easier to control if you use less alcohol. Only use rubbing alcohol that is 70% alcohol or higher. 4. Wait for the alcohol to dry almost completely before you remove the rubber band. If you remove it too soon the colors will bleed beyond the circle. 5. Pay attention to what colors are next to one another. Those colors will mix, and it is too easy to end up with ugly browns if you don't pay attention. 6. Leave lots of white space between colors. 7. Symmetry in the sharpie design makes for a more attractive circle. 8. Flower designs look especially pretty. 9. When you are done with one circle, start the next circle in a very different part of the fabric. If your rubber band cinches a circle that is still wet, it will mess up the design. 10. There is lots of patience and waiting required for this craft. Watch a movie at the same time so you don't get impatient! Have you tried the sharpie tie dye method yet? What tips could you share? We'll probably be doing this again, and would love to have some new ideas. Baby J is almost six months old, and has finally found his way on to the blog. 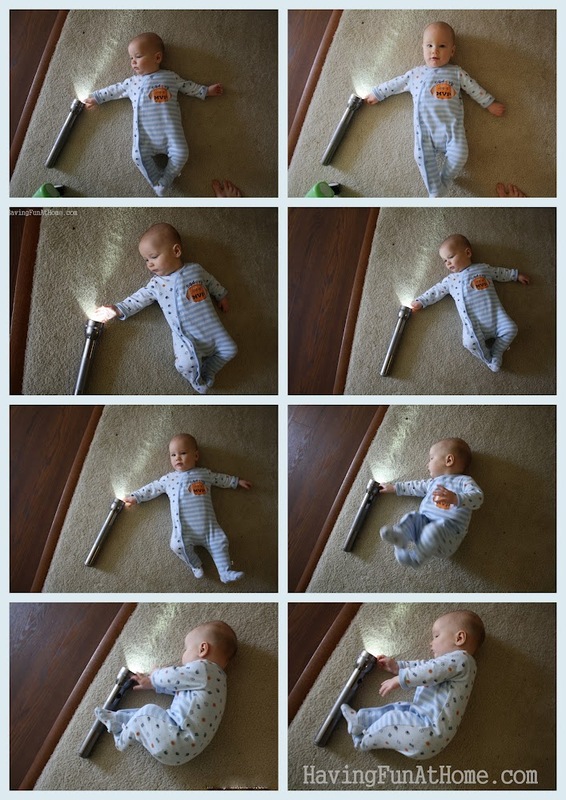 M and G were playing with a flashlight and happened to set it down next to him. It was so interesting to watch him explore. There's an idea that's been floating around Pinterest these days that I've been curious about for a while- color a ceramic mug with sharpie and bake in the oven at 350 degrees for 30 minutes. So simple and exciting if true- but it made me wonder why anyone would bother to buy real ceramic pens if a sharpie works just as well. With such a fun idea though and all the materials already in our house...definitely worth a try. First, I used a black sharpie to draw a bubble letter outline for "I Love Dad" on one side and a blank face on the other side of a plain white, ceramic cup. I baked it at 350 for 30 minutes, waited for it to cool and let my preschooler use our colored sharpies to decorate. Back in the oven for another 30 minutes. So what were the results from our little experiment? 1. The marker does not smudge when it is handled. It didn't even come off when we ran it through the dishwasher. 2. If you work at it with your fingernail or with a rough sponge, you can get some of the marker to rub off. Rubbing alcohol erases it completely. 3. I imagine ceramic pens work better and don't rub off, but for a child-made mug for Daddy I think the sharpie is just fine! I looked it up, and it does seem that sharpies are non-toxic, but since they are not manufactured for use on food items, I think playing it safe and keeping the pen marks out of the inside of the mug and away from the rim might be a good idea. Looking for more Father's Day ideas? The following is another example of something that is generally a flop can sometimes still produce deceivingly decent pictures. 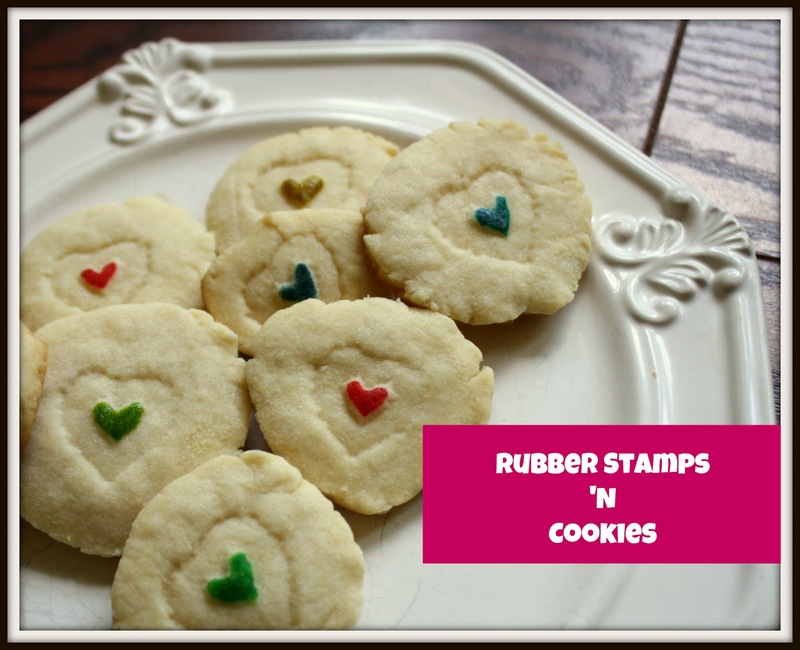 Inspired by Martha Stewart, we tried using our rubber stamp collection on cookie dough the other day. We washed off the stamps, made up a batch of shortbread dough (because I had read that it puffs up the least in the oven), and experimented a little bit. - even when you are as careful as possible, the picture often fades away in the oven. Only about a third of ours turned out. I love that the girls were completely unaware of its having been an aesthetic flop. To them, it was just like playing with sweet playdoh. They especially liked using our pawprint stamps on the doh, and they enjoyed painting the cookies afterward with diluted food dye.